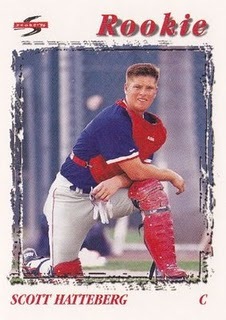 Scott Hatteberg is a catcher who played for Pawtucket from 1993-1996. He also played in ten games in 1999. Didn't he turn out to be a real dirtbag? Okay, here we go. In 1993, at age 23, Hatteberg batted a mere .189 through 18 games. He split time between double- and triple-A that year. He went 10-53... A bunch of singles and one home run. In 1994, Hatteberg once again split time between New Britain in Pawtucket. He caught 75 games out of 78 played. Hatteberg's OBP that year was a puny .332. 1995 saw a slight increase in Hatteberg's passed balls - up to seven from the previous season's four. However, he struck out less and walked more. 1995 was also the year Hatteberg made his major league debut. All his offensive numbers increased as well. Hatteberg finally saw some results from his dedicated PED regimen in 1996. WHAT, NO! No, that's not what I meant to say at all! What I meant to say is that he hit 12 home runs through 90 games and bumped his OPS up from .798 to .841. His RBI practically doubled - 27 in '95, 49 in '96. It was a good year for the then 26 year old. Scott Hatteberg's mural hangs rather grandly in the upper part of the third base tower. See you there on Thursday!